Use these handy adaptors to join serial devices together. These "cross over" the transmit, receive, and control lines to allow the RS-232 ports of two PCs to communicate with each other. They can be used in other similar scenarios as well. The compact size of these adapters makes them ideal for tight spaces. These are available as Female-Female, Male-Female, and Male-Male adapters. 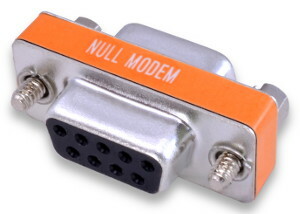 The same functionality is available in null modem cables as well. Note: Pin 9 is not connected on either side.